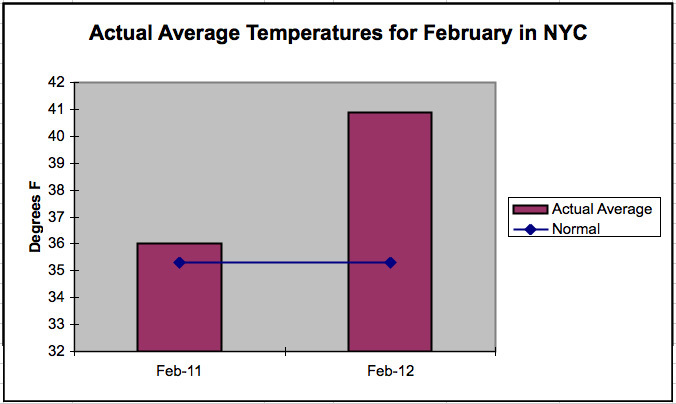 February 2012 was unseasonably warm in New York City. In fact, it was our warmest February on record with an average temperature of 40.9°F. That is 5.9°F above normal. The eight days we experienced with temperatures at or above 50°F helped break the old record of 40.6°F which was set in 1984 and tied twice in 1998 and 2002. In terms of precipitation, the city was rather dry this month. We received 1.37 inches of rain, which is 1.84 inches below normal. February is usually our snowiest month with an average of 8.8 inches accumulating. This year, however, we only saw a paltry 0.2 inches. Given these spring-like conditions, can we blame the flowers in Central Park for blooming early?